Incase this is your first time seeing the teddy bear trend, I’ll show you some of my favorite inspo pics below. As you can see, the jacket looks super cozy. I love this because I can literally throw it on with almost any outfit. Since the jacket is oversized on me, I like wearing it with something tighter underneath so that my body shape doesn’t get completely lost. Of course, that does not mean that you have to wear it the same way I do… Wear it however you want! In case I haven’t mentioned it before, I am 4’11 and a half. Yes, that half an inch is very important to me lol. I have to be careful when I wear certain oversized pieces because its easy for me to look like I’m getting swallowed by my clothes. If any of you have a similar petite body shape then you know the struggle! I just wore a simple black long sleeve tucked in, super basic, some black jeans and the same black mules from my Valentine’s Day post. I threw on a belt right before I left the house because I thought the jeans and the top needed some separation being that they are both the same color. Plus, the belt is black with gold hardware and it matched my shoes. 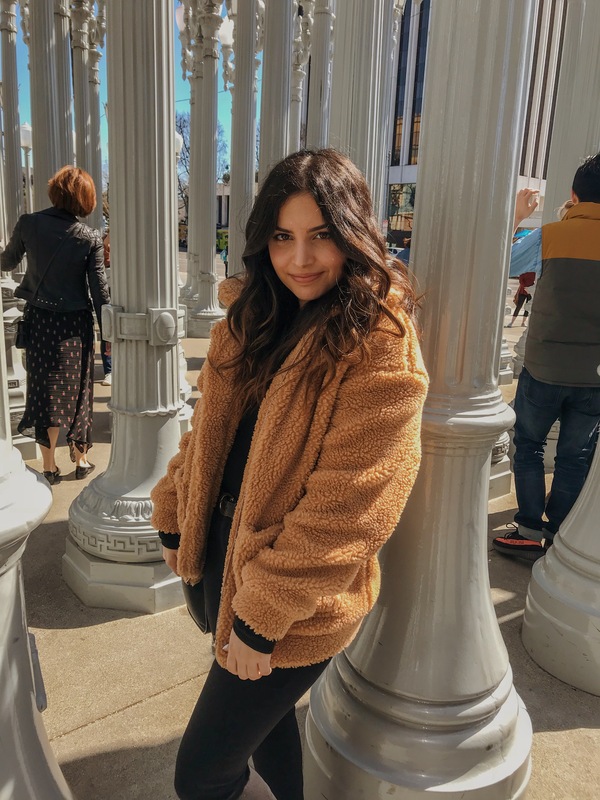 I love the look of an all black outfit with a pop of camel (or a pop of any color really) but I’ve also worn this jacket multiple times with many different colors. Camel is a neutral color, at least to me, so you can basically wear it with just about anything. 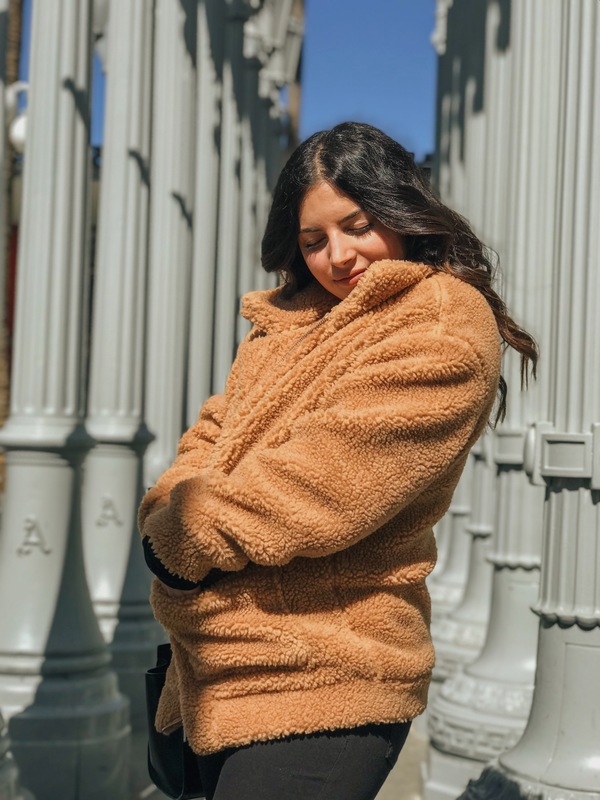 There are a lot of different teddy bear coats on the market. I think the most popular one is this one from I.AM.GIA. I loved this jacket, but I was a little hesitant on spending that much money when I wasn’t even sure how it was going to look on me. I take my only shopping very seriously. I mean honestly, who wants to wait in anticipation for at least a week just to find out that the clothes look like crap and that you have to send it all back. Not me! So I obviously did some extensive research, and finally found this jacket from SHEIN. My biggest tip when it comes to online shopping is to read and trust the reviews!!! Especially the ones with pictures, those are my best friends. You can see how what you’re about to order will look like when it gets sent to you, and how it looks on the body. Since this specific coat is on sale right now, I know it might be gone soon. As always, I have some options for you! My favorite details about the coat is the big collar and the huge pockets. I didn’t want to settle for anything less, so I don’t expect you to either! 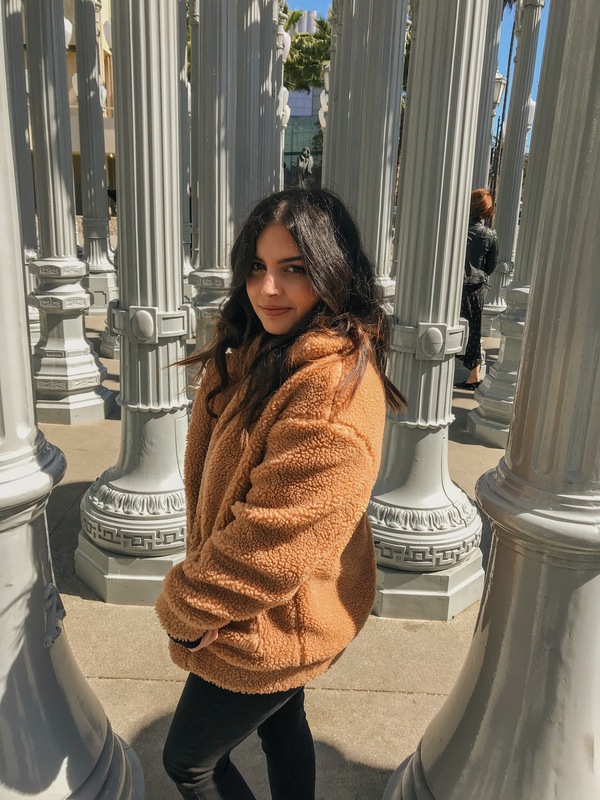 This coat from Urban Outfitters is cropped, but it has a super cute cream color, is still oversized AND has the huge collar and pockets. If you’re loving the style of the coat but don’t see yourself wearing it in this color, here is another color option for you. 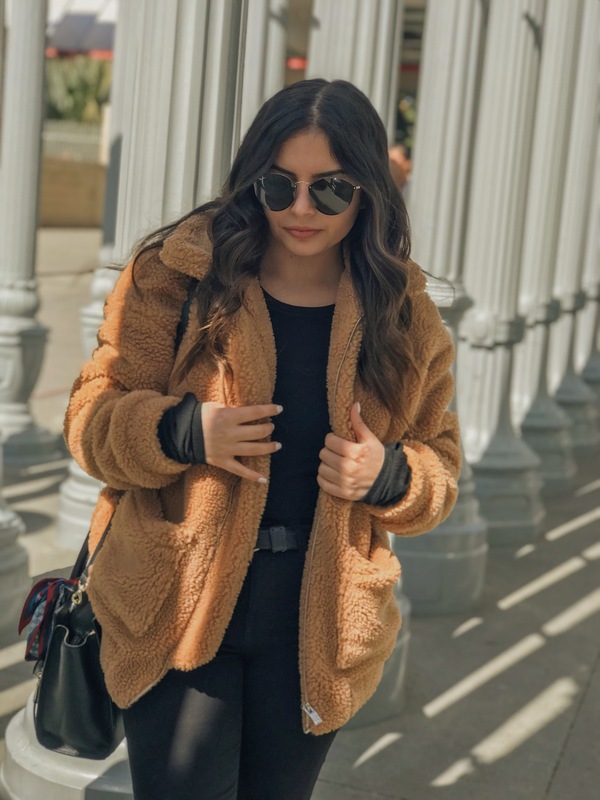 A black teddy coat will look just as cute, and for some people might be even easier to incorporate into their wardrobe. Those two coats are a little pricey, so I’ve included some other choices as well. 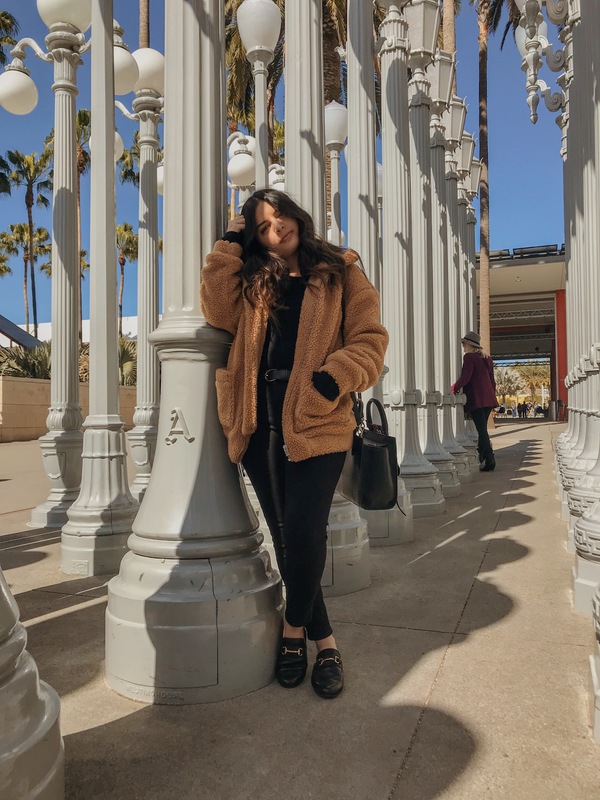 I found two options that look almost identical to my coat, and although I have never ordered from them there are some good reviews with pictures included, just how we like it! Option one looks just like mine and it comes in 4 different colors and option two, also comes in 4 different colors and is on sale.